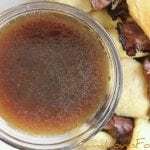 Au Jus is such a delicious addition to the perfect French Dip Sandwich, you're going to love our Au Jus recipe! Caramelize the onions in a small amount of olive oil. Add garlic and cook for a minute or two more. Deglaze the pot with white wine, then add Worcestershire sauce and cook for another minute, stirring constantly. Add beef broth and bring to a light boil. Reduce heat and simmer for about 3 minutes. Strain broth and then return it to pot. Add flour and simmer an additional 5 minutes. Serve with French Dips and ENJOY!